I don’t know a single family not trying to reduce the amount of sugar in their diets. I talk to my friends and family members and they’re concerned for themselves, but they are especially concerned about their kids. We hear all kinds of conflicting information these days on how sugar is impacting kids; everything from hyperactivity and childhood obesity to Type 2 diabetes. One thing we all can agree on is that it can’t hurt to reduce sugar consumption. One simple way parents can help cut sugar from kid’s diets is by eliminating or reducing sugary drinks. The question becomes, what replaces them? Many kids love soda, soft drinks and sports drinks. Yet as any parent knows, kids can be finicky and resistant to change. It’s not easy to replace sugary beverages if you can’t get them to drink something else. Why not try iced tea? Tea Phactory has several kid friendly teas that we have tried on kids of all ages. These teas are honestly delicious, full of flavor and some are even naturally sweet. Any of our teas can be made sweeter without the addition of sugar or artificial sweeteners by brewing them with the naturally sweet and calorie-free stevia leaf. We typically recommend decaf or herbal teas for the little ones. These teas are completely caffeine free and some have other health benefits as well. It’s unmistakable…that unique combination of flavors…a hint a licorice, a touch of cherry, a dash of cinnamon, a bit of orange peel. It’s root beer, remarkably rendered with all of the pleasure and none of the guilt. Kids love this naturally sweet, calorie and caffeine free, herbal infusion treat. If you have a SodaStream, you can use it to add bubbles. If your kids enjoy powdered drink mix this is the tea for them. Splendiferous Rooibos makes a flavorful impression with its extraordinary fruit flavor and light note of mint. Organic green rooibos is blended with hibiscus petals, peppermint and elderberries for a burst of fruit flavor followed by cool mint. If you’re a kid, or a kid at heart, try Raspberry Rush. This Tea Phactory Signature Blend has a burst of “fresh from the garden” fruit flavor and a light citrus twist that is sure to please everyone. For older kids who can have some caffeine we have two teas that are great for tweens and teens. Even with the naturally occurring caffeine, these teas have less caffeine than many caffeinated sodas. This aromatic tea embodies the color and playfulness of a summer carnival. Sweet with a hint of tanginess, Carnival is a unique blend of black and green teas, dried papaya pieces, rosehips and sunflower petals. 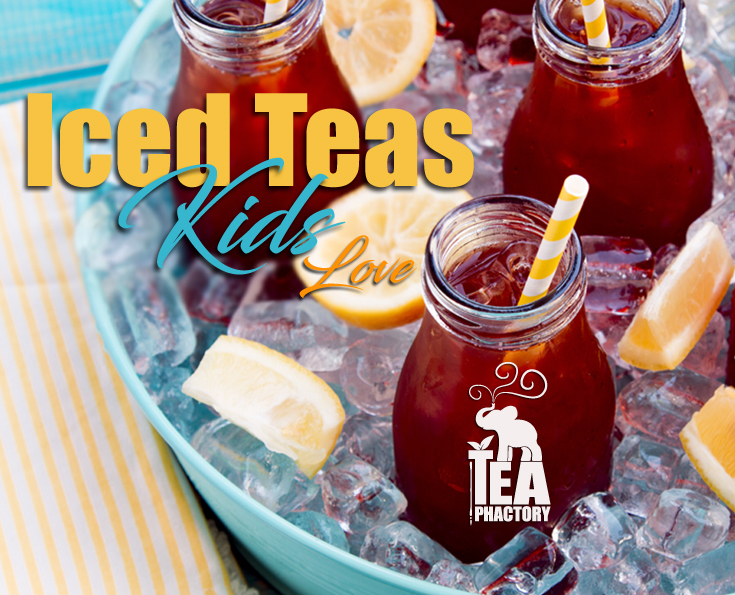 Why not have a little fun and try one of these iced teas as an alternative to your kid’s favorite soda or sports drink? We suggest brewing the tea together following our brewing guide. It’s a fun family activity and helps your child buy into the idea of trying something new. It’s also more exciting than just mixing up your usual powdered beverage. Let’s be sensible; always supervise children when using hot water brewing methods. However, kids can use our cold brew method to make iced tea on their own. Oh, and hey, these teas aren’t just for kids. Adults love them too and find them a great substitute to regular or diet soda. As grownups, many of us not only want to cut down on sugar but are also looking to reduce the chemical craziness of artificial sweeteners.